C.J. Anderson’s effectiveness recently has put Todd Gurley’s value into question. Todd Gurley began the 2018 season on fire, accumulating yards and scoring touchdowns at a historic pace. Despite missing the final two games of the season, the second-highest-paid running back in the NFL led the league in rushing touchdowns and finished fourth in yards from scrimmage. And yet, Gurley may start Super Bowl LIII as a backup. Since returning from injury, the Rams star has been outplayed by fill-in journeyman running back C.J. Anderson, who has more or less relegated Gurley to a change-of-pace role. How is this even possible? How can a player go from being the league’s premier running back to backing up a guy who was cut by the Denver Broncos in May, the Carolina Panthers in November and the Oakland Raiders in December? We’ve seen backup running backs fill in admirably before — when the Chiefs released star RB Kareem Hunt this season, Damien Williams was just as, if not more, productive1 — but it’s hard to remember it happening to a back as seemingly indispensable as Gurley, let alone on a stage as big as the Rams are on now. One explanation is that the Los Angeles Rams offensive line is just very, very good, and Gurley has been reaping the rewards. But I think there’s another factor at work — one that has more to do with the head coach than with the players on the field. But one problem with adjusted line yards is that the metric doesn’t account for the number of defenders the offensive line has to face during any given play, which has huge implications for how effective a rush will be. Running the ball when there are seven or eight defenders near the line of scrimmage is much harder than running against six or fewer. If a team runs more of its plays against light fronts, we should expect it to have more success in general. We’d also expect the offensive line in particular to have an easier time opening holes against defensive fronts that have fewer, rather than more, defensive players near the line of scrimmage that they have to block. Looking at 10 years’ worth of data from ESPN’s Sports & Information Group,4 that’s exactly what we find. If we split the field up into 10-yard chunks, there isn’t an area of the gridiron that exists where running against seven or more men in the box is easier than running against six or fewer. In fact, if all you know about a running play in the NFL is the approximate field position of a team and the number of defenders near the line of scrimmage, you’re able to predict the leaguewide yards per carry with an extraordinarily high degree of accuracy: 96 percent of yards-per-carry totals are explained by the offense’s field position and the number of men the opponent has in the box. 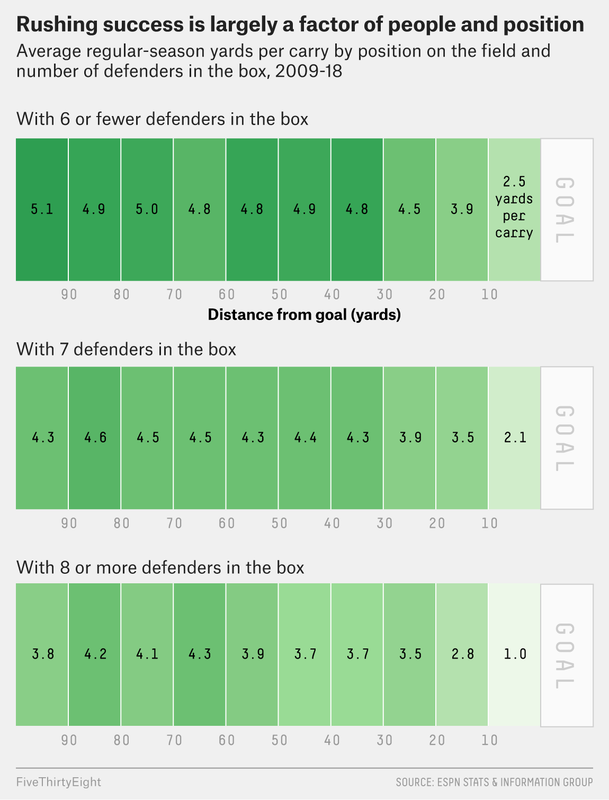 How many defenders are in the box is almost certainly the most important factor in determining rushing success in football, so it follows that we should try to account for it. But an NFL offense is not just at the mercy of the defense when it comes to running against stacked or light boxes. Play-callers actually have a large degree of control over how many defenders near the line of scrimmage they will have to face. When an offense trots out three or more wide receivers, the defense nearly always matches with an equal number of defensive backs, which limits the number of linebackers on the field and lightens up the box. Since the 2009 season, the number of rushing plays that faced six or fewer defenders in the box has skyrocketed. This is a reflection of an evolving offensive philosophy, not a defensive one. The increasing number of light boxes was a response to the massive shift by NFL offenses to the “11 personnel”: 1 running back, 1 tight end and — most importantly — three wide receivers. Over the course of the past decade, the 11 personnel became the most popular personnel package in the NFL. It’s now the base NFL offense. 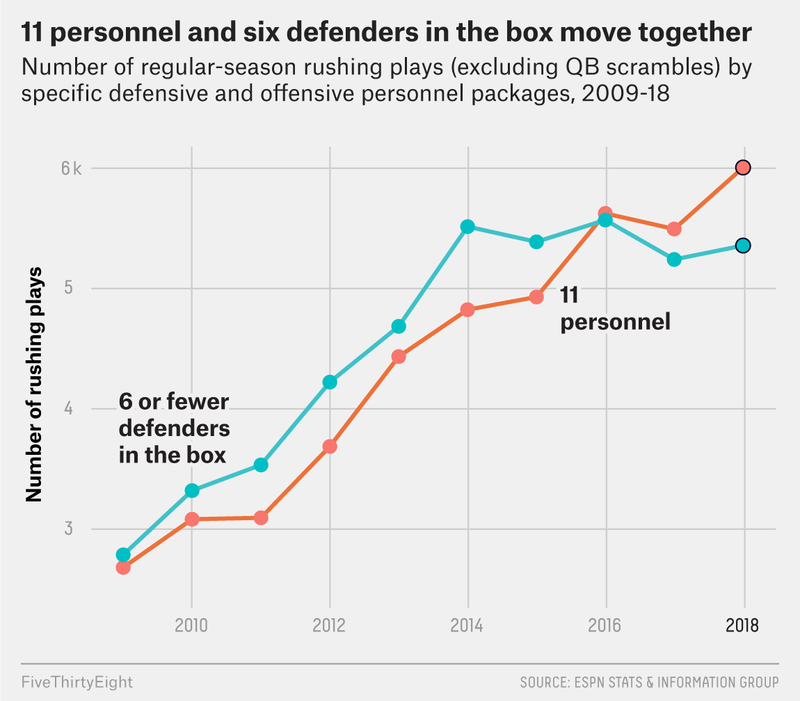 And nickel5 is the current base defense — a sea change from the previous decade when 3-4 and 4-3 defensive fronts were the norm. Returning to Los Angeles, the Rams used the 11 personnel more than any other team in the NFL in 2018. So it’s possible that instead of the Rams being generationally superior at run blocking — or instead of Gurley being a one-of-a-kind game-altering running back — the Rams’ offensive line just faced fewer crowded fronts than other teams. This would at least provide some context for their overwhelming success — and help explain how Anderson could Wally Pipp an MVP candidate in the playoffs. Both Football Outsiders’ line yards and my version agree that the Rams had the best rushing offensive line unadjusted for box count. When we look at line yards over expected after accounting for box defenders, however, the Rams aren’t the best run-blocking offensive line ever. In fact, they’re not even in the top four since 2009. *Box-adjusted line yards adjusts for number of defenders faced near the line of scrimmage. The 2012 San Francisco 49ers — who were 5 yards from winning a Super Bowl under Jim Harbaugh and QB Colin Kaepernick — take the honor of fielding the best run-blocking offensive line since 2009. Thinking back on the number of big plays Frank Gore broke off against stacked boxes, the ranking certainly passes the smell test. The 2010 Jaguars offensive line, ranking just ahead of the Rams, was also formidable: It opened massive holes for Maurice Jones-Drew and Rashad Jennings, who combined for nine touchdowns and 1,783 yards on the ground despite QB David Garrard doing nothing to scare opposing defenses away from crowding the line and trying to stop the run. The Rams still fielded the fifth best offensive line in our time frame and easily the best this year. But much of the credit for the success of the running game should probably go not to Gurley, Anderson or the Rams offensive line, but to Sean McVay. The second-year coach has put his players in the very best position to succeed through his scheme and play-calling. Running the ball out of the 11 personnel helps dictate to the defense and lightens the box for his linemen, allowing them to open holes even thrice-cut journeyman running backs can run through. While league observers can fall into the trap of over-weighting the effect of coaching, in some cases the credit and praise is warranted. The distribution of talent across teams is so even, it’s really not so much a matter of who you run the ball with — or behind — it’s a matter of when you run it. McVay chooses his spots as well as anyone in the NFL, and the Rams are in Super Bowl LIII because of it. Williams averaged 114 yards from scrimmage and 1.6 TDs in regular-season games he started, while Hunt averaged 109 yards from scrimmage and 1.4 TDs. Football Outsiders also adjusts for plays from shotgun, down, distance and situation, and it removes any scrambles and handoffs to players who aren’t running backs. For a total of 126,154 running plays. We excluded scrambles and any plays for which no defender data was given. Defenses with five defensive backs on the field. I removed QB scrambles but left WR run plays in. I also did not adjust for shotgun. 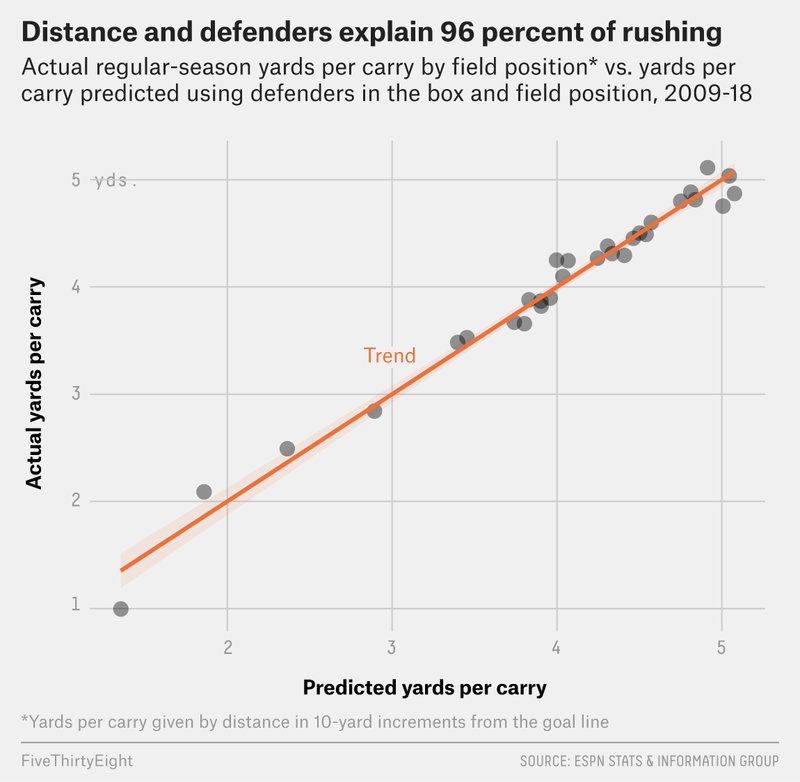 Finally, I did not scale the adjusted line yards metric so that it looks like running back yards per carry. My version of adjusted line yards will not agree exactly with Football Outsiders, but there still is a high degree of correlation. Each metric predicts the other at an r-squared of 0.68.